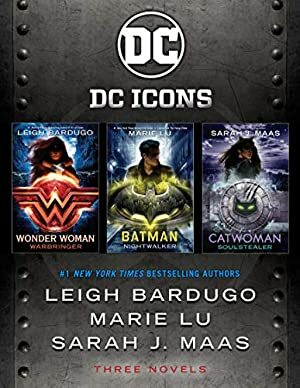 For fans of Sarah J. Maas, Marie Lu, and Leigh Bardugo, this ebook collection includes all of these #1 New York Times bestselling authors' DC Icons titles--Catwoman, Batman, and Wonder Woman--not to be missed by any reader who loves powerful YA fantasy! Three instant New York Times bestsellers of DC Comics' iconic characters! This ebook collection is truly SUPER. Catwoman: Soulstealer Selina Kyle is CATWOMAN. There's a new thief on the prowl in Gotham City, and she's got killer backup. It's time to see how many lives this cat really has. Log In to track Marie Lu on eReaderIQ. to be notified each time the price drops on any book by Marie Lu. to stop tracking Marie Lu. Log In to track Sarah J. Maas on eReaderIQ. to be notified each time the price drops on any book by Sarah J. Maas. to stop tracking Sarah J. Maas. The current price of this book is $36.99 last checked 3 months ago. We last verified the price of this book about 3 months ago. At that time, the price was $36.99. This price is subject to change. The price displayed on the Amazon.ca website at the time of purchase is the price you will pay for this book. Please confirm the price before making any purchases.